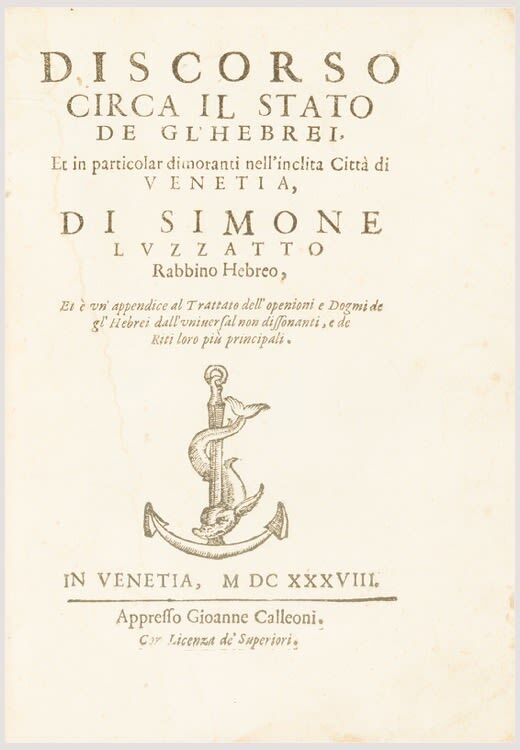 Discorso circa il Stato de gl` Hebrei, et in particolar dimoranti nell`inclita Citt`a di Venetia (“Discourse on the Jews of Venice”). FIRST EDITION. Text in Italian. Printer`s device on title. Simone (Simcha) Luzzatto (1583-1663) was appointed senior Rabbi of Venice following the death of Leone Modena. Luzzatto was motivated to compose this important text due to a threat to the Jews of expulsion from Venice. Luzzatto devoted the first part of the Discorso to a demonstration of the economic utility of the Venetian Jews. He also argued that due to their natural inclination to political quietism, local Jewry posed no threat to the security of the Venetian Republic. See Benjamin Ravid, Moneylending in Seventeenth Century Jewish Vernacular Apologetica, and Bernard Septimus, Biblical Religion and Political Rationality in Simone Luzzatto, Maimonides and Spinoza in: Twersky & Septimus (eds.) Jewish Thought in the Seventeenth Century (1987), pp. 257-75 and 399-433.